The EMEA gesture recognition and touchless sensing market report showcase detailed analysis of the technologies, applications, products, and countries of the broad markets.All the major applications, technologies and countries that are and will be important for the EMEA gesture recognition market, are identified and articulated in the report.The touchless sensing market is segmented into two broad level classifications namely; touchless sanitary equipment and touchless biometrics. The total EMEA touchless sensing market is expected to reach $2.67 billion by 2018 ata double digit CAGR from 2013 till 2018. The gesture recognition market value in 2012 was approximately $70.28million and is expected to reach $1.64 billion at 62.37% CAGR. The report discusses all these markets by the different technologies, products, and applications.The touchless sensing market is segmented in two major product types namely; touchless biometrics and touchless sanitary equipment market. The touchless biometric market has been segmented by the different types like face, iris, voice, and touchless fingerprint biometrics. Similarly, touchless sanitary market has different types like; faucets, flushes, hand-dryers and others. The gesture recognition technology market includes technologies like 2D camera based, 3D camera based, ultrasonic, infrared arrays, and capacitive technology. These major technologies and products have been mapped against each other and also against the major countries. The report also identifies different market dynamics, i.e. drivers, restraints, and opportunities of each of the markets. Major players of the current market and the players with high potential to enter the market have been identified and profiled. Apart from the company profiles, a Competitive landscape (CL) of the key players for each of the markets has been discussed in the report. The CL include detailed market share analysis, mergers and acquisitions, collaborations, partnerships, new product developments, and the key growth strategies of each player. The report also provides detailed about porters five force analysis for Touchless sanitary, touchless biometrics and gesture recognition markets. All the five major factors in these markets have been quantified using internal key parameters governing each of them. The report includes critical market data showing the price trend analysis, emerging trends and value chain analysis. The touchless sensing and gesture recognition is also mapped against major individual countries likeGermany, U.K., France, Italy, Middle-East and Africa. Complete value chain, allied industry segments & value chain analysis of EMEA’s Touchless Sensing and Gesture recognition industry and its impacts on the market. The increasing security concerns in the major countries of the region have pushed for the need of accurate and reliable biometric systems. The e-passport program has picked up pace in European Union and has created huge demand for the touchless biometrics. The biometric systems are more accurate than the touch-based biometric systems since they are independent of touch. This eliminates the error of the image captured due to the skin distortions when pressed against the screen. Moreover, in case of iris recognition and face recognition, the features of the iris or the face do not change over the years. The advantages of these technologies and the rising need for robust security systems are expected to drive the biometrics market in EMEA. The touchless sanitary market that includes products like touchless faucets, touchless soap dispensers, touchless hand dryers and so on, will witness growth in their shipments as the governments increase their focus on hygiene in the region.The need for touchless sanitary equipment is increasing rapidly and expected to increase at a higher rate. Issues relating to healthcare and hygiene concerns have gained interest over the years in many countries of EMEA. The booming construction sector in Middle East will allow for the integration of these technologies at a faster rate. The revenue from EMEAs touchless sensing market is shown in the table below. The touchless sensing market for EMEA is estimated to reach $3.17 billion by 2018. The market is expected to grow at a CAGR of 26.64% from 2013 till 2018. The touchless biometrics market constitutes the major share of the total market and is expected to maintain a larger one for the next five years. The huge demand for Smartphones and Tablets is a definite driver for the gesture recognition market in the EMEA region. This region has witnessed a number of product launches from OEMs in the APAC and some countries like Germany, U.K., France Italy and the MEA region are critical consumers of this market. 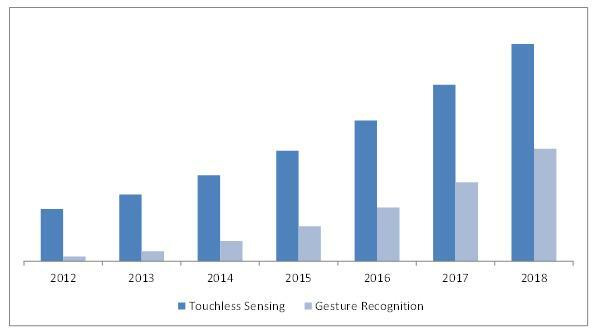 The figure below shows the trend of the EMEA gesture recognition and touchless sensing market from 2012 till 2018. The gesture recognition market revenue from EMEA is expected to grow from $145.90 million in 2013 to reach $1.64 billion by the end of 2018, increasing at a CAGR of 62.37% from 2013 to 2018. Gesture recognition market is witnessing rapid industry developments across the value chain. Software providers like eyeSight (Israel), PointGrab (Israel), Omek Interactive (Israel), SoftKinetic (Belgium), and Elliptic Labs (Israel) have witnessed huge investments. The key technology providers like PrimeSense (Israel), ESPROS (Switzerland), and PMD Technologies (Germany) have launched significant products like the depth sensors and the associated software. Gesture recognition is still in the emerging phase but has proved to be the next generation technology that has the potential to revolutionize the way humans interact with machines. The technology is currently being integrated majorly into consumer electronics. This would help to push the technology towards maturity and in turn the decrease in price. 6.3.1 How Gesture Recognition Works? *Details On Overview, Products & Services, Financials, Strategy & Development Might Not Be Captured In Case Of Unlisted Companies.